Tapper by S.A. Combs is a tale of the past, present, and future. In the past, Tapper grew up in a government facility meant to imprison him, because he was too dangerous and too untrained. Teach was his mentor and father figure, the one person he was able to connect with as a child. As he ages, he trains to work for the government, using his powerful empathic abilities to kill for them. In the present, he's sent to help a ragtag group with plans to exile himself to Mitta-4, a planet on the fringe of the universe. He's caught off guard by his attachment to the team, and by a woman with no voice who may hold the key to his future. 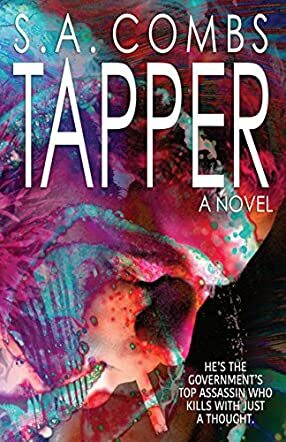 Tapper is unexpected, a unique voice in a dark and, at times, isolated world. It's not about Tapper's empath skills, but about his journey in both the past and the present, and how those two stories influence his future. S.A. Combs has a unique style, telling Tapper's life in two separate but connected stories, and pulls this off brilliantly. He's everything you want from an anti-hero, he's got a tragic backstory, a gritty and warped view of life, and a heart that honestly cares. It's a quick read, with the chapters in the past reading more like a recap as Tapper reflects back on it, and even breaks the fourth wall by commenting directly to the reader. Tapper is gritty and tragic, yet hopeful and endearing with a certain charm, much like the character himself. This novel is perfect for science fiction lovers, but anyone can relate to and fall in love with Tapper.